In Unity on 16.04 I was able to adjust the scale of my monitor to my liking. In my case this is 120%. However after upgrading to 18.04 the display configuration only has two size options, 100% and 200%. How do I set a custom display scaling? This question is actually a duplicate of This Question. The effect I was looking to duplicate from 16.04 is "Text Scaling Factor". 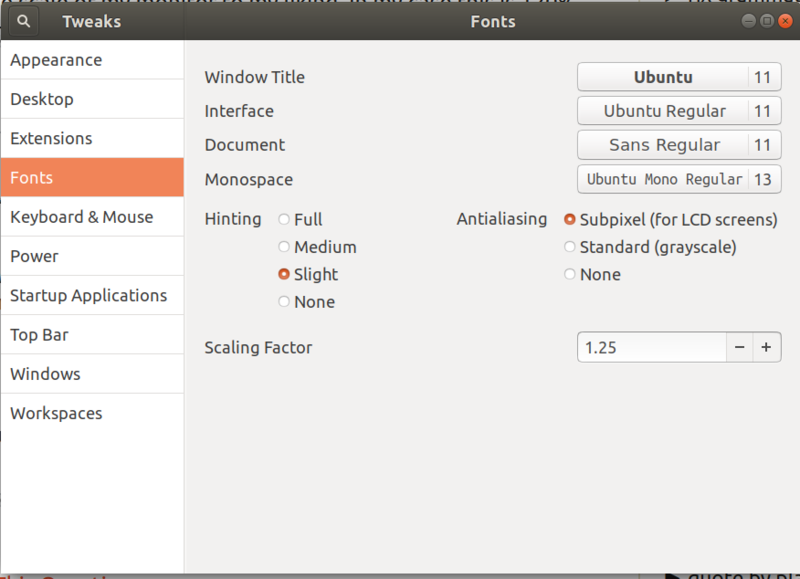 This setting can be adjusted using gnome-tweak-tool. Click on the Fonts tab under Tweaks. The setting is called "Scaling Factor" which I set to 1.25 for my perfect setting. What you're referring to is called fractional scaling and unfortunately it's not supported yet under 18.04 using default display server Xorg as Ubuntu has decided to move back to this from Wayland used in version 17.10. Then open Settings -> Devices -> Displays and now you should have the ability to scale in fractions 100, 125, 150 etc. You can follow this thread here Enable fractional scaling for Ubuntu 18.04 for more details on this and other workarounds. Hope you find this answer helpful. Not the answer you're looking for? Browse other questions tagged fonts screen configuration 18.04 or ask your own question. Mixed DPI setting on multiple monitors - Ubuntu 18.04 - how? Why is my printer scaling everything down, and how do I fix it?